50 years ago this month Oak Parkers were abuzz over the destruction of a pioneer family’s home. Abram and Sara Gale first came to the little village of Chicago around 1835 and around that time bought 320 acres west of Chicago which later became the Galewood neighborhood north of Oak Park. The Gales became influential citizens in Chicago and as their family grew they eventually became key players in real estate and pharmaceutical businesses. 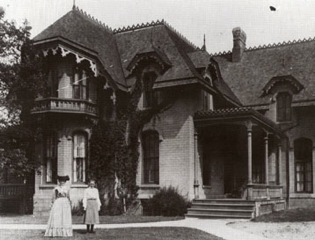 Edwin O. Gale, one of their six sons, constructed a large Gothic Revival style home on the corner of Lake St. and Kenilworth Ave around 1860 in the tiny village that would soon become Oak Park. It stood for almost 100 years until it was demolished in September 1961 to make way for a modern high rise apartment building. Charles Gale, served as a president (1971-1976) and founding member of The Historical Society of Oak Park and River Forest and worked to preserve our community’s rich heritage with the creation of our organization in 1970. For more about this and other historical topics please contact the historical society at oprfhistorymatters@sbcglobal.net or 708-848-6755.